I don’t know how you can read this book and not be inspired. I was excited to receive a review copy of Start Something That Matters from the publisher, because, well, what Mr. Mycoskie is doing fits in fantastically with my worldview. I hoped the book would be neither too dry, nor too preachy, and lucky me, all my hopes came true! 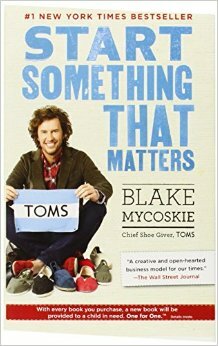 The book is the story of TOMS, which is a shoe company that operates on a 1for1 business model: for every pair of shoes they sell, they give one to a child who is without. The book goes into great detail of how Mr. Mycoskie came up with the idea, how he implemented it, and the secrets of his success. There are also many inspiring stories from other companies who are doing similar things, and some who got the idea from TOMS and have started their own for-profit 1for1 companies. I was pleased to see that there was some really good info on how business people and consumers can make a difference, in both big and small ways. I was also glad to see that he didn’t act like everyone can just run off and start their own company tomorrow, like many of similar books do. Instead, he encourages people to start small, and gives many examples of people who did just that. The writing was engaging, accessible and compulsively readable. Many pictures and little boxed-in stories (there has to be a name for that, right?) accompanied the text. Overall I was very impressed with the content and the writing style. Though I did give the book 5 stars, there were one big thing I had an issue with: labor practices. I didn’t dock my rating because the issue was with the ideology, not with the writing of this book. However, I was uncomfortable with Mr. Mycoskie encouraging people to hire full-time, long-term unpaid interns. Yes, I get that many start-ups do this, and it can be a great opportunity for the interns. In fact, all the interns who began at TOMS inception are still with the company. But at one point he mentions a company hiring as many as 20 unpaid interns. If you have so much business that you need that many interns, then you need to be paying your employees. He also encouraged people to use the site 99designs. Basically, this is a site where people put up a request for a logo or other design, and then graphic designers get to work for free in the hopes that their design will be chosen. Sure, there are plenty of contests similar to this with various t-shirt companies and magazines. But if a company wants to work with a graphic designer to have a logo made, then they need to commission the work. As a freelancer, I am uncomfortable with this model and I wish he hadn’t encouraged it. That aside, the book was excellent and I highly recommend it to anyone who wants to make a difference, on either a personal or professional level, or someone who’s simply interested in how this very different company began. This entry was posted in book reviews, non-fiction and tagged book review, mycoskie, non-fiction. Bookmark the permalink.